Researching Civic Media: Empowering Citizens or Progressive Fallacy? Through the discussion of a number of texts and accounts of their own experiences, researchers will discuss the concept of civic media as well as appropriate research frameworks for civic media, including ‘research by design’ approaches. How can we build a research agenda that is both critical and productive? Digital media has significantly impacted how we participate in civic life, including how we gather together in groups, interface with public institutions, seek out information, and advocate and agitate towards social change. Institutions of all sorts are struggling to adapt to emerging digital practices, as they invent, adopt or adapt new tools, and rethink structures of participation. Community activists, civil society practitioners, policy makers and technologists are searching for viable solutions. Communities of practice have emerged around discourses such as the Smart City and Civic Tech, building tools and sourcing data to solve civic problems. But it is necessary to question the nature of these problems, whose problems they are, and if they are, in fact, problems at all. While the shiny new app solves some problems, it surely creates others. While big data addresses some gaps in knowledge, it opens others. In this context, there is need to harness an intellectual discourse that is both critical and applied, that can create knowledge about a digitally enhanced civics, while guiding design for the creation of new approaches. The notion of ‘civic media’ was introduced first as a design objective meant to foreground the affordances of digital technologies for citizen empowerment and community engagement, as a counterweight to claims about the negative impact of digital media on social and civic life prolific in the late 1990s and early 2000s. 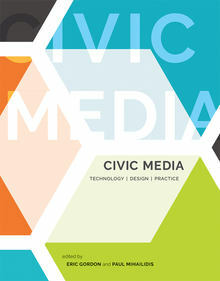 At the same time the term ‘civic media’ is also used analytically to emphasize the complex relationships between people, technologies, practices and the common good, moving away from a more simplistic functionalist paradigm in which civic technologies are presented as tech solutions that can be applied to various societal domains. In a civic media approach, researchers try to understand the complex ways in which communities use media and technology to achieve or strive for a common good. Research on civic media often combines analysis of media practices with design and action research. For instance, research through design projects can be aimed at empowering local communities, or contribute to imaginations of a future society that provides civic alternatives for the neoliberal commodification and ‘smart consumer orientated services’ approach that dominates current discourse on smart cities, disruptive innovation and creative economies. However while this approach can be promising, it also has it criticisms. Civic tech approaches have been reproached of ‘solutionism’, as well as harbouring a ‘progressive fallacy’. The latter refers to the implicit assumption that affordances of digital media for communities to self-organize will contribute to progressive goals and more democratic societies. Yet, these same affordances have also aided all kinds of exclusionary, populist and even terrorist collectives. In this workshop, researchers on civic media will discuss their research strategies on civic media. Many working in this field see an urgency to contribute to the design of alternative media practices that work towards a common good and reinforce public values. How can we build a research agenda that is both critical and productive? What approaches of research by design have proven to be productive, and what issues are in need of further address? In the workshop a group of about 15-25 researchers will discuss research strategies and methodologies for civic media. Eric Gordon will present a brief introduction to some of the main themes and issues, based on his current book Civic Media. Technology | Design | Practice. In addition, participants are invited to bring in and briefly present (5-10 minutes) one or more examples of civic media studies (from their own research projects or otherwise) that they would like to discuss / analyze. A number of texts from the book will be provided as a background for the discussion. Participants can apply by sending a brief motivational email, and (if applicable) short description and problematization of 1 or 2 cases they would like to bring in / present. Applications can be sent to b.g.m.de.waal@hva.nl and will be accepted on a rolling basis. Readings from Eric Gordon and Paul Mihailidis eds. Civic Media. Technology | Design | Practice (Cambridge, MA: The MIT Press, 2016). The workshop is organized by the Lectorate of Play & Civic Media at the Amsterdam University of Applied Sciences (Martijn de Waal, Gabriele Ferri) and the department of Media and Culture Studies at Utrecht University (Michiel de Lange).